Are you a fan of Paul Di Resta? And are you likely to be in the vicinity of Milton Keynes on Tuesday evening this week? Or, even if not all of this applies, do you have a burning question you'd like to ask him? 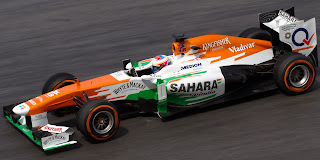 If so, it's your lucky day, as Sahara Force India star and Whyte & Mackay Global Whisky ambassador Paul Di Resta will be making a pit stop at ASDA Eastlands Superstore in Milton Keynes on Tuesday 25th June from 6pm -7.30pm to meet with fans and sign autographs, ahead of the weekend's British Grand Prix. In a season wherein the fortunes of British drivers have been patchy, Paul is currently riding high: he's scored 34 points, scoring in every round apart from one, and equalled his highest ever finish of 4th place at the Bahrain Grand Prix. There are plenty of things you could ask him! And I'm sure you'll come up with a few. Paul had this to say on it all: 'It’s been a really exciting year for me so far and I hope to build on the team’s successes over the remainder of the season. It’s always special to race on home soil; to know that the fans are behind me wishing me well helps to spur me on. The Whyte and Mackay signing is a great opportunity to get out and meet my supporters to say thanks and I hope to see lots of you there'.